All profits went to charity. Union LA tapped a wide variety of peers and friends to collaborate on an exclusive, charitable T-shirt. 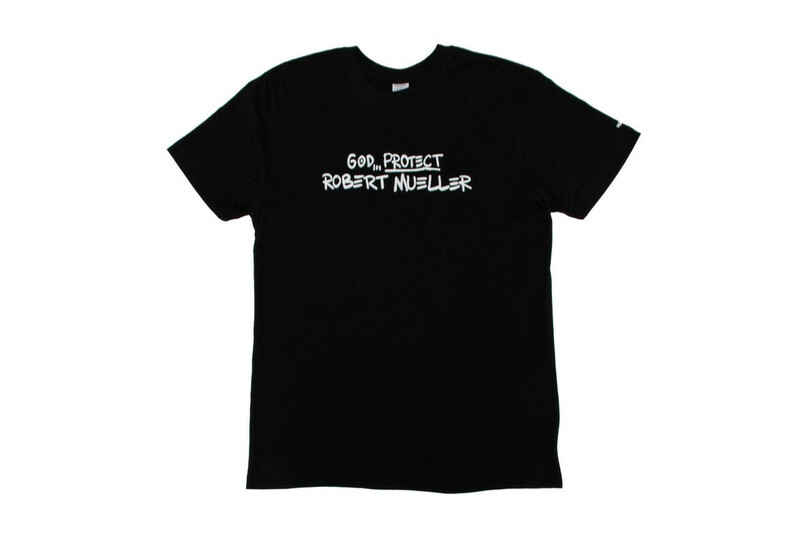 Emblazoned with each collaborator’s logo on the rear, the “God Protect Robert Mueller” shirt sported the eponymous print on the front of the shirt. A direct quote from legendary director Spike Lee, the phrase is obviously in to Mueller’s Russian probe investigation; considering that the inspiration is political in nature, it only makes sense to donate profits to charity. As such, the proceeds from the shirt will benefit Generation Citizen, an organization that aims to educate students about civic rights and rules so as to encourage them “to participate in our democracy.” The black tee sports the stylized on the front, with branding from the likes of NOAH, UNDEFEATED, Awake NY, Some Ware and Bephie on the rear. The tee was released on Union LA’s webstore, where it’s currently sold out. Most recently, NOAH debuted its heritage-minded Fall/Winter 2018 lookbook. The phrase “God protect Robert Mueller” originally came from the legendary artist and filmmaker Spike Lee. We teamed up with some of our friends who share that sentiment, thanks to @chrisunion of @unionlosangeles , on a collaborative T-shirt that symbolizes our support of Mueller’s important work. We hope Spike Lee’s words similarly inspire other artists and creators to join us in sending a message. – It’s safe to assume that most of you know who Robert Mueller is. Just to be safe though, we’d like to take the time to explain what the Mueller investigation is actually about. Robert Mueller has been assigned to investigate the possible connection between people within the United States and the Russian government tampering—or attempting to tamper—with the 2016 Presidential Election, with the goal of aiding Donald Trump in becoming our commander-in-chief. – Our personal politics aside, we believe this investigation is absolutely necessary. Robert Mueller and his team should be allowed to see this investigation through to completion. Multiple times, Donald Trump has spoken about firing Mueller and his team while the investigation is still underway. This raises a serious question: why would the president of the United States want to fire someone whose job it is to get to the bottom of events that may threaten our democracy? Shouldn’t the president be the biggest champion of our democratic process? – As a show of solidarity with our peers and everyone else loudly supporting the Mueller investigation, 100% of proceeds from this shirt will go to Generation Citizen. Generation Citizen is a non-profit helping to teach students across the country how to get actively involved in the political process. By empowering the youth to make a difference in the messy politics of our country, we hope to enable the next generation to live in a better country than we have. – Whatever the results may be the Mueller investigation will have tremendous implications either way, whether there was collusion from within our government or not. We’re living in dangerous times, therefore we’d like to say: God protect Robert Mueller. Including a new Case Studyo x Jean Jullien bookend sculpture. Rich textures, unique textiles and billowy silhouettes.